After reading “Political Power: Bill Clinton” I was a bit leery of giving this one a read since it’s by the same company and seems to be a series along the same lines as “Political Power.” I had no idea what to expect, but I feared the worst. My worries however were unfounded. 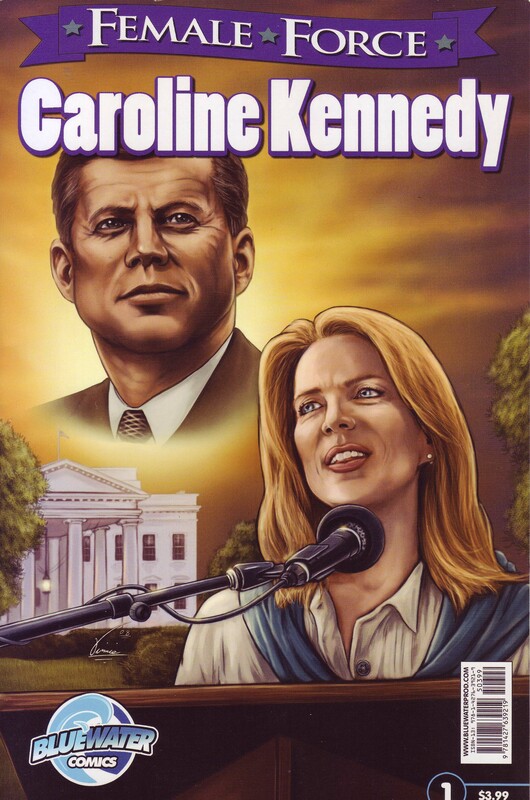 The writer for this issue does an exceptional job of sticking to the facts and not trying to sensationalize or trivialize Caroline Kennedy or her family. In fact, at one point in the issue the author is even depicted ripping up a tabloid and saying that they will not be discussing Caroline’s children at all, which is nice to read. Although the writing is clear and easy to read, I do have a bit of griping about the layout of the narrative. They begin the issue by of course covering the biggest event in Caroline’s life…the death of her father. Which is fine, but then they bounce around a bit. They talk about how death has shadowed Caroline and her family, and then go to how her parents met and after that they mostly follow chronological order. The beginning though is a bit rough to follow and while I can sense what they were doing it didn’t work too well…at least for me. The artwork itself is fairly decent throughout most of the issue, although it does have issues in some places. It’s clear that for the most part, at least in the early part of the issue, they tried to use photo references to make sure they were accurately depicting Caroline and her family. Although in some cases this didn’t work to well as the kids have mutant hands (too large for their bodies.) In the latter half of the issue though the artwork starts to suffer a bit, whether it’s a different artist or they were just trying a different style I’m not sure. The characters start to look more two dimensional and have sharper edges and features that make it a bit difficult to look at. For example, when Caroline announces that she’s going to support Obama her smile looks like the Joker’s from Batman. It’s a bit creepy and unsettling. The color palette chosen is also a bit lacking. There aren’t a lot of vibrant colors and they’re mostly staid browns and yellows which make the entire issue seem somber, even at what should be happy points. My biggest complaint overall with the issue is the large number of ads. They seem to appear every other page and are competing with the story as some of the colors match what’s seen in artwork. It’s just really disrupting to the flow of the issue to have to go past so many of them, often on double page spreads. 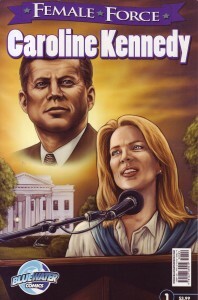 Overall though this is an excellent introduction to whom Caroline Kennedy is. The writer does an excellent job of not going into tabloid like areas and presents the information in a clear and easy to understand format.